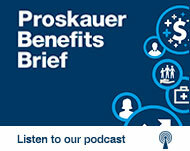 In this episode of The Proskauer Benefits Brief, partner Ira Bogner and senior counsel Adam Scoll discuss the key considerations for ERISA plan fiduciaries when delegating investment authority over plan assets. We will break down some of the material ERISA issues that may apply when an ERISA plan hires a separate account investment manager or invests in a private investment fund deemed to be holding ERISA plan assets. Adam Scoll: Hello, and welcome to the Proskauer Benefits Brief. Legal insights on employee benefits and executive compensation. I’m Adam Scoll, Senior Counsel in the firm’s Boston office, and I’m here with Ira Bogner, partner in our New York office. And today, we will be discussing key considerations for ERISA plan fiduciaries when delegating investment authority over plan assets. Ira, I think it would make sense if we first discuss the most likely situations, where an ERISA plan fiduciary would find itself delegating investment authority over plan assets. Ira Bogner: The fact is, most plan sponsors are not investment experts, but they, nonetheless, are tasked with managing their plan’s investments. Accordingly, it is very typical for a plan sponsor, or a committee appointed by a plan sponsor, to delegate some, or all, of its investment authority to third parties, who are investment professionals. The most obvious situation would be an ERISA plan sponsor has hired a firm to manage some, or all of the plan’s assets in a separately managed account. When an ERISA plan’s assets are placed into a separately managed account, these assets are still considered plan assets of the plan and are subject to all of the requirements under ERISA, relating to the investment of plan assets. Adam Scoll: An ERISA plan fiduciary could also be deemed to have delegated fiduciary investment authority over plan assets when it invests into a pooled investment vehicle, such as a private investment fund, if the fund is unable to qualify for a plan asset’s exception under the Department of Labor’s plan assets regulation. Generally, if a private investment fund has significant benefit planned investor participation, also referred to as being over the ERISA 25% limit, and it cannot qualify as an operating company such as a venture capital operating company or a real estate operating company, the fund will be deemed to be holding ERISA plan assets under ERISA. Ira Bogner: And by investing ERISA plan assets into such a fund, an ERISA plan fiduciary is deemed to have delegated fiduciary investment authority over such plan assets to the manager of the fund. For the most part, the key ERISA considerations for the delegating ERISA plan fiduciary, will be very similar, whether the delegation occurs in the separately managed account context or by way of investing plan assets into a pooled investment fund, deemed to be holding plan assets. Adam Scoll: Regardless of the context, when delegating investment authority over ERISA plan assets, the plan fiduciary must comply with its basic fiduciary duties under section 404 of ERISA, which include a duty of loyalty, and duty of prudence. It must diversify the investments of the plans so as to minimize the risk of large losses. The delegation must comply with the plan’s governing documents, to the extent consistent with ERISA. And lastly, the plan fiduciary is required to make such a delegation in a manner that does not result in the plan, or the fiduciary, engaging in a non-exempt, prohibitive, transaction. Ira Bogner: In this regard, the fiduciary should avoid basing its delegation decision on criteria other than obtaining the best investment return to the plan. In other words, avoiding any conflicts. It should undertake a diligent and thorough process that takes into account the benefits and risks of such delegation, perhaps with the assistance and advice of a separate investment professional. Given such important fiduciary duties that apply plan investment decisions, it makes sense that if a plan fiduciary is not an investment expert, it might want to delegate such responsibility to someone that is. Adam Scoll: And I think it is very important for a delegating plan fiduciary to understand that delegating investment authority may reduce its fiduciary responsibility relating to such delegated investment duties. It does not eliminate it. Some fiduciary responsibility always remains. ERISA generally provides that if a fiduciary investment authority is prudently delegated to a person that qualifies as an investment manager under section 338 of ERISA, then the delegating fiduciary will not be responsible for the day-to-day investment decisions of the investment manager, which leads us to a key consideration. Does the investment professional qualify as an investment manager? If it does not, then the delegation might not have the desired legal effect. Ira Bogner: However, even if the firm does qualify as an investment manager, the delegating fiduciary still has a duty to prudently monitor such an investment manager and should always be watching the store so as to minimize the risk of being liable on a co-fiduciary basis, for certain breaches by the manager, or being liable for inappropriately continuing to retain the manager. The next overarching key consideration is ensuring that the investment manager understands its fiduciary duties, and that it can and will manage the investment of the plan’s assets in a manner that complies with ERISA and avoids engaging in a non-exempt, prohibitive transaction. Adam Scoll: And there are two types of prohibitive transactions to be concerned about, that we will only touch on briefly. There are conflicts of interest, self-dealing prohibitive transactions, and partying interest prohibitive transactions. In regard to the conflict of interest, self-dealing prohibitive transactions, the delegating fiduciary will want to ensure that the manager’s investment guidelines and compensation structure are structured in a manner that incentivizes the manager to achieve the highest investment return for the plan without taking into account its own self-interests, and generally prohibits the manager from self-dealing. Ira Bogner: In regard to partying interest prohibitive transactions, ERISA broadly prohibits many transactions between a plan or plan asset account, and third parties which are fiduciaries or service providers to the plan. As the universe of prohibitive third parties could be quite large, especially for large ERISA plans, these rules could really restrict a manager’s ability to operate absent an exemption from these restrictions. Thankfully, there is a very broad and helpful exemption from these partying interest type prohibitive transactions, referred to as the QPAM exemption. In order for that exemption to be available, among other requirements, the manager must qualify as a qualified professional asset manager, or a QPAM. It is for this reason that delegating plan fiduciaries often require an underlying investment manager to qualify as a QPAM. Adam Scoll: Another key consideration is that simply hiring and paying an investment manager is a prohibited transaction that requires an exemption. Thankfully, ERISA section 408(b)(2), which is often referred to as the necessary services exemption, provides such an exemption, assuming the contract entered into with the manager is reasonable, the compensation paid is reasonable, the arrangement is terminable on reasonably short notice under the circumstances without penalty to the plan, and certain initial and ongoing disclosures are provided by the manager. Ira Bogner: A few other items a delegating plan fiduciary should consider, ERISA section 412 generally requires that the investment manager be covered by an ERISA fidelity bond. ERISA section 44B generally requires that the investment manager maintain the indicia of ownership of the plan’s assets within the jurisdiction of the United States District Courts, subject to certain limited exceptions. And ERISA may prohibit or limit an ERISA plan from holding certain types securities issued by the plan sponsor of the plan. There is obviously a lot more to consider, but I think we’ve touched on a number of the key considerations in this area. Adam Scoll: Thank you, Ira. And thank you all for joining us on the Proskauer Benefits Brief. Stay tuned for more legal insights on important benefits and executive compensation and be sure to follow us on iTunes.